⬅ Will You Fight With Me? We believe Maddy has some muscle inflammation of the chest. The condition is not life threatening but at times it is very painful. She has some ups and downs with pain. Although the downs are difficult, the ups are bigger than the downs. For that we are thankful. Maddy is amazing and we are proud of how she is aggressively working. She definitely takes after her Mom. We are grateful for the prayers. Please keep them coming. We are praying for continued reduction in pain; no pain spikes, and no anxiousness. I can tell you that God is doing some deep work in all of this. He is teaching us endurance and trust on a level we have never experienced. This situation has opened up spiritual conversations that might not have otherwise have happened. Some people are literally stepping closer to Christ as God works in this situation. And the prayer. Wow. People have surrounded us in extraordinary ways. God is healing. He is using many people as part of the healing. He may not be healing on our schedule, but I trust that he knows best. There is much more I could write. I will save it for another day. In the meantime, thank you for your prayers and please keep it up! We are not out of the woods but we are making progress. Thanks for being on the journey with us. 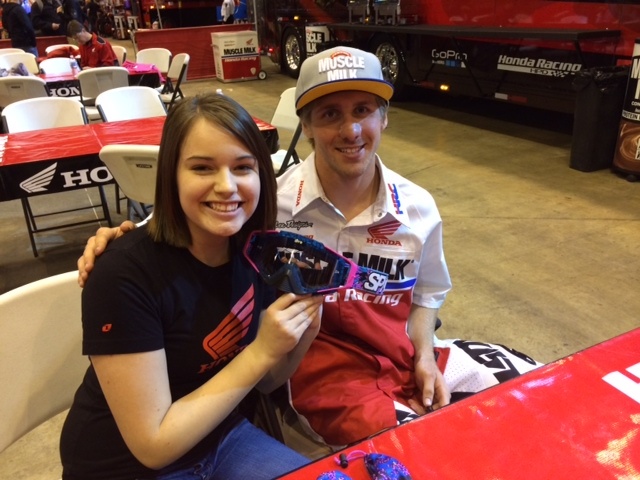 Picture above: This weekend Maddy was able to have a brief private meet up with her favorite Supercross athlete, Justin Barcia. Justin gave her a pair of autographed goggles. She is still smiling. I love that picture! It was so great to see her so happy and even better that she made it through the whole day without too much pain. I’m praying for her as always!